I am a guitar player and have played in various bands steadily now for over twenty years. From garages, sheds, basements, studios, and even dedicated music rooms, I’ve rehearsed in all the usual places that bands tend to use for their practice spaces. I’ve always gravitated towards bands that play more of the harder varieties of rock n’ roll. So, of course, that means big drums, big amps, and loud P.A. systems. It wasn’t until my early twenties, when I got into running live sound and recording, that I started learning about acoustics and how the make-up of a room can drastically effect what the musicians perceive while playing. This is why properly soundproofing a band rehearsal space is so important. Here’s a typical band rehearsal space scenario – You’re the guitar player, and you’ve spent all week learning the latest batch of tunes the band had decided to work on the week before. You get to rehearsal and are ready to rock. You are rehearsing in your drummer’s garage. 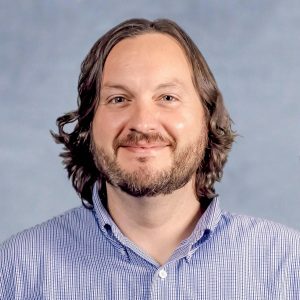 It’s made up of a combination of sheet-rock walls, a concrete floor with a couple of area rugs, and a sheet-rock ceiling; a typical garage setup with all hard surfaces. The first song starts with just you playing but once the rest of the band kicks in, you find yourself lost in the mix. That awesome solo you worked so hard on in the previous days gets drowned out underneath the mud and confusion of what your other band mates are playing. Since you can’t hear yourself, your natural reaction is to turn up your amp. This works great for a song or two, but then the bassist turns up his or her amp. The drummer starts hitting their drums a lot harder to compensate for the increase in volume that your amps are producing. The vocals get drowned out and soon you are back to where you were at the start. A similar scenario used to happen to me. A lot. Not only that, but this type of situation can also cause hearing fatigue and hearing loss if you’re not careful (ALWAYS wear hearing protection no matter what). There were a couple of bands I played in where I hated going to rehearsals for this very reason. What’s the point in rehearsing if you can barely hear yourself or what the other band members are playing so that you can work on making the songs sound better in the first place? Your rehearsal room acoustics should allow you hear the initial sound from your instruments and vocals, not a reflection of the original sound. The most effective treatment for this situation is to add soft, absorptive materials to all of the hard, reflective surfaces in the room. The band that I am currently playing in recently moved from rehearsing in the other guitarist’s detached garage to a room in our drummer’s split-level house. This man-cave, has wood paneling and sheet-rock on the walls, pile carpet on the floor, and a textured plaster ceiling. There is also a large brick fireplace that takes up a good portion of one of the walls. The first time we rehearsed in the new space, the sound quality was horrendous. Harsh highs, muddy lows, and vocals that were fighting to get over top of the blaring guitar amps that were in turn trying to compete with the volume of the drums. In a space such as this, I knew we would need as much absorption as possible. For this type of application, the more sound deadening material you can add to the room, the better. To fix the sound issues, we installed several 2″ thick Anchorage Fabric-Wrapped Panels (which are very similar to the standard AlphaSorb® Fabric-Wrapped Panels) to cover the wood paneling on the lower portion of the walls. We then added acoustical foam to the upper portion of the walls and above the drum set, all in an effort to kill as much of the reflected sound as we could. The difference from before we applied treatment was night and day. We were actually able to turn our amps down a little. The volume of the drums was not as overbearing as before. The vocals through our P.A. system could now cut through the instrument mix better and were actually intelligible. Instead of a wash of sound, the instruments were more articulate. You could pick out details that were lost otherwise without the treatment in the room. Our drummer’s wife even remarked that one of the cover songs she overheard us rehearsing sounded like it was being played off of a stereo. Quite an improvement indeed. Every room is different. 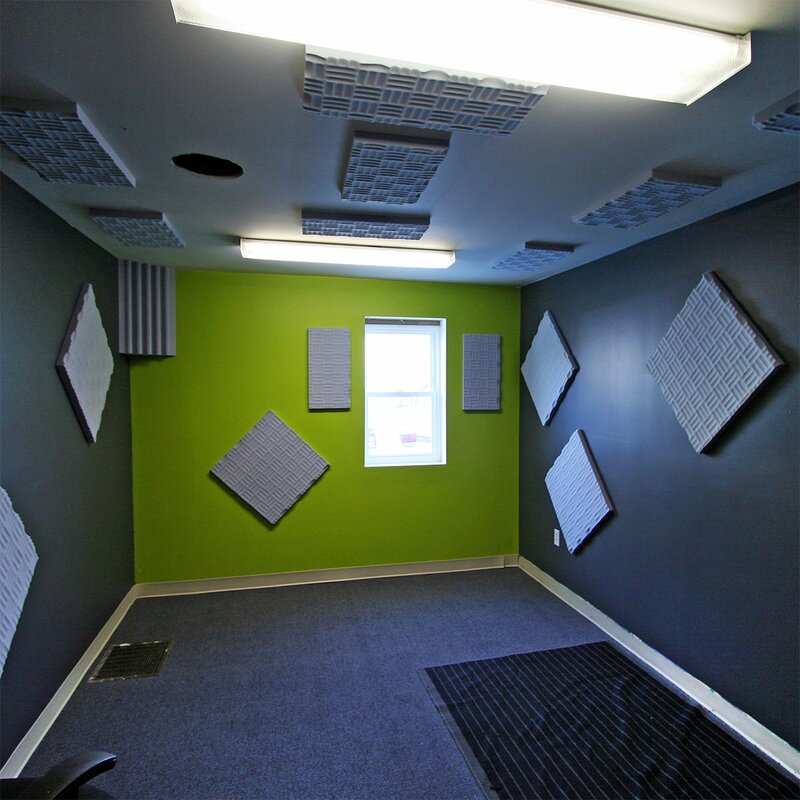 There are other materials you can use to help with dampening sound in a band rehearsal space, as well. In addition to what I have previously outlined, acoustical blankets can be hung on walls and garage doors to both reduce reverberation and block sound. A combination of ClearSonic drum and amplifier enclosures can be used to reduce the volume output from instruments. This also helps decrease the bleed from your bandmate’s instruments which is useful for rehearsal or when recording. Unless your band practices in a location that is in the middle of nowhere, chances are there is someone nearby. If this space is in your home, you will also have your family to contend with. They might not be pleased with all your rock n’ roll exploits from time to time. 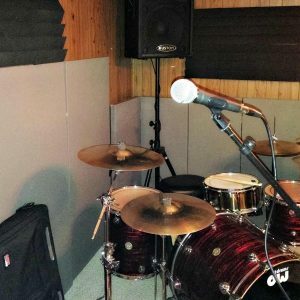 If you are practicing in a facility with multiple practice spaces, it may be difficult to focus on your music if you are hearing other bands practicing. 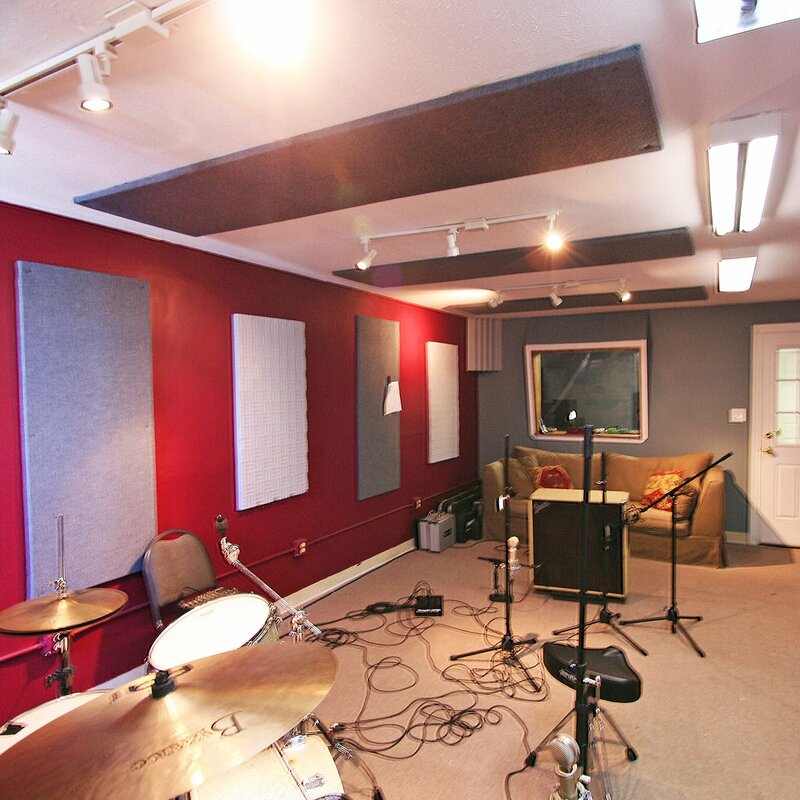 More often than not, studios and practice spaces are located in commercial areas. Traffic noise and sounds from other businesses may also be a concern. The objective is to prevent and block sound from outside the room and keep your music from leaving the space. This topic has been covered in some our other blog posts, so I will keep this brief. First, you may just want to check your door. Having a heavy, solid core door will block more sound than a hollow core door. Also, if there are gaps around the door that allow air to pass, so will sound. You can seal easily seal a door using a door seal kit. Windows are also a weak point in a structure. Hang a barrier blanket to cover your windows. This will keep sound in as well as add to the window’s insulation value. To block airborne and structure borne sound through walls, ceilings, and floors, you need to add heavy, dense and resilient materials to them. This can include using materials such as mass-loaded vinyl sound barrier, combination sound absorbing/blocking acoustical blankets and Green Glue sound dampening compound. For low frequencies such as bass guitar and kick drum, frequencies can actually vibrate the structure. This is what is structure-borne noise. Treatment for this type of application calls for using products that isolate and decouple the walls, floor, ceiling from the studs and joists that they are attached to. This can include using materials such as sound isolation clips, floor underlayment, and vibration isolation pads. Sound Check Studios in Richmond, VA used many of these tips when updating their rehearsal room acoustics. For more information on using these specific types of treatment, please read the following articles on Soundproofing a Wall and Soundproofing a Floor. What I’m looking for at this point is an onsite consult/estimate on what it will take to isolate my practice space, reasonably, from the rest of the house. I don’t want to spend anymore time or money on my best guesswork from reading…that hasn’t worked. Thank you visiting our website! You could certainly hire an acoustical engineer to test your existing structure and offer recommendations. However, many of our staff have years of experience as a musicians, sound engineers, and acoustical materials. With their knowledge and experience, they can help you to design a solution for isolating your practice space from the rest of your home. To start, we will need you to send pictures and dimensions of the space along with what type of expectations you are looking for with regards to the amount of sound attenuation required, etc. Have no experience in any of soundproofing. But have a question if yall can help. I want to know if soundproofing can be done before i invest in it and cant use it. I want to build a storage shed and make the upper section sound proof to have a very loud rock band practice with Pa system. I have neighbors very very close to me(50ft) and would like to know if soundproofing can be done in this scenario? Hi Mike, Thank you for contacting Acoustical Solutions. I assume based on your comments that the shed you intend to build is going to be two stories, with the upper level housing the band that you rehearse with, correct? If this is the case, it is possible to soundproof, the results you get though are going to be based on the construction methods you use while building the shed and how much money you want to invest in the materials necessary to soundproof at the level needed for your application. Here is a blog post on Soundproofing a Wall. It shows typical construction methods used to isolate and block sound through walls and ceilings. The most basic concept to keep in mind is that in order to block sound, you will need to add mass and density to the structure as heavy, dense materials are what are necessary to block airborne sound. A basic example of this is to utilize two layers of drywall instead of one. By adding the second layer of drywall to the existing layer, you are adding more mass and density to the wall assembly. 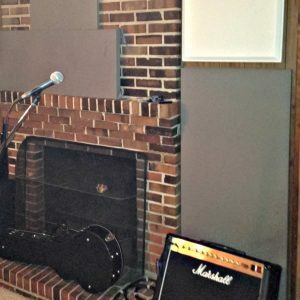 This particular example is usually effective for blocking lower level noises like voices, etc., but when it comes to soundproofing a loud band, you are going to have to use much more robust techniques to really get acceptable results. This would include the use of mass-loaded vinyl barrier in the wall assembly, two layers of sheet rock with Green Glue sound dampening compound, and isolation clips to decouple the wall from the studs (this helps with reducing low end vibrations caused by low frequencies generated by bass guitar, kick drums, etc.). You will probably also want to consider installing absorptive materials such as acoustic foam in the space once the build-out is completed so as to improve the overall acoustics of the space. This will help with things like speech intelligibility from the vocals going through the PA, and also should allow you to hear amps and other instruments more clearly without having to turn up as much. Please let me know if you have any questions on this or would like to discuss it further.